This 8.14 acre tract has some rugged topology that could make it ideal for installing some zip lines and building tree houses in the large Birch trees scattered around. There is a seasonal branch running through a portion of the property that creates wet weather waterfalls. The tract is fully wooded with mostly younger growth and some older trees scattered around. There are plenty of blackberry bushes and nut trees scattered over the property. 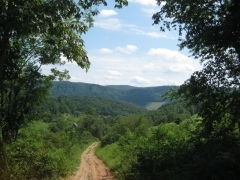 The property is bordered on two sides by rough cut access easements making accessing different parts of the property a little easier (the easements would need to be improved and graveled before anything other than a four wheeler or side by side used them). The front of the tract (between where the two access easements converge) has the most gentle terrain and would be an ideal site for a small getaway cabin.The rear, higher up portions of the property, have some pretty nice views of the opposing ridge lines.